Israeli Prime Minister Netanyahu accepted President Obama’s invitation to attend this week’s nuclear arms discussions. After further reflection he told Obama he would send a substitute, Deputy Prime Minister Dan Meridor. 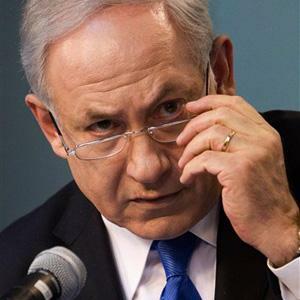 Word had reached Bibi that Turkey and Egypt might demand that Israel sign The Nuclear Non-Proliferation Treaty. The Prime Minister was shocked at such impertinence. He accepted the invitation because the talks were to focus on nuclear terrorism. He claims he did not anticipate that anyone would ask him about Israel’s nuclear arsenal, which has existed since the 1960s in the Dimona desert. This little pirouette on the world stage was performed in front of an audience that knows full well that Israel is not going to sign any treaty that forces it to admit the truth about its own nuclear arsenal. Israel has two nuclear reactors, including one in the city of Dimona that is believed to be used to build the country’s stockpile of atomic weapons. The Jewish state has never confirmed nor denied that it possesses nuclear weapons. Israel also has not signed the Nuclear Non-Proliferation Treaty, which aims to halt the spread of nuclear technologies that can be used to produce atomic weapons. In recent weeks, Israel has humiliated the Turkish prime minister, assassinated an Hamas official in a neutral country, embarrassed the US vice president, and traveled to Washington to be glorified by AIPAC, after refusing Obama’s request that he put a temporary freeze on settlement expansion. This would have been a good time for Netanyahu to change his image from international pariah to the latest member of the nuclear arms club. We obviously would like to have the prime minister, but the deputy prime minister will be leading the delegation and it will be a robust Israeli delegation,” US national security advisor James L. Jones told reporters on Air Force One while returning with President Obama from Prague, Czech Republic, where the president signed a nuclear arms limit agreement with Russia. The White House has been pushing next week’s summit as the capstone of a week of activity on limiting nuclear weapons, including the signing of the arms treaty by Obama and Russian President Dmitry Medvedev. The administration also released its latest nuclear profile, which for the first time said the United States will not use nuclear weapons against a non-nuclear state if it abides by the 1970 Non-Proliferation Treaty– a warning to Iran and North Korea, which have some form of nuclear programs. The Hebrew-language NRG/Maariv website, reports, under a headline, “Dimona reactor workers not welcome in the US”, that workers at Israel’s Dimona nuclear research reactor who submitted visa requests to visit the United States for ongoing university education in physics, chemistry and nuclear engineering, have all been rejected, specifically because of their association with the Dimona reactor. According to the report, this is a new policy decision by the Obama administration, since reactor workers were until recently being issued visas to study in the US. Is this a very quiet first step by Obama to say to Israel that it is well past the time for Israel to stop the charade that it has no nukes? Israel does have a nuclear arsenal it refuses to acknowledge. The US is a party to Israel’s continued denial of its long established nuclear program. Barack Obama has inherited a situation in which his nation is a co-conspirator in deception. He cannot be comfortable with this situation. It is hard to believe that he intends to continue to participate in the deception much longer. Plans for this week’s Washington conference were announced several months ago. Did the visa ban on Dimona scientists lead Bibi to fear a conference tribunal in which he would have to either admit, evade, or outright deny his nuclear program? Whatever his motivation, Bibi has bailed out on the conference. That does not, however, end the matter. Barack Obama’s visa ban has sent a strong signal which will not go unnoticed when the 47 nations gather in Washington April 12-13 to discuss how they can work together to prevent nuclear war heads from falling into the hands of militant groups. Bloomberg News reports that in a conference call with reporters, US administration officials said that the Washington conference will focus on separated plutonium and highly enriched uranium that could be smuggled or sold on the black market to groups such as al-Qaeda. What we are witnessing with Bibi’s periot is a split in Israel’s own internal politics. The right wing leadership under Bibi has isolated Israel from the world’s political community. At the same time, the world’s business community sees Israel as a young business partner with strong growth potential. Ironically, Israel’s nuclear arms industry has long been an important part of the ever-expanding economic growth in Israel. The alliance included a French supply of critical military equipment and fighter aircraft, and even a secret agreement to cooperate in the development of nuclear weapons (page 178). Senor served as media spokesman for the US army during the early years of the Iraq war. Until he withdrew from the race recently, he was a declared candidate for the Republican nomination for the US Senate in New York State. Singer is a columnist and former editorial page editor of the Jerusalem Post. The two authors, an American and an Israeli, give considerable credit for Israel’s “economic miracle” to David Ben Gurion, Israel’s founding parent, and current Israeli President Shimon Peres for launching “start ups” for Israel’s economic growth. Peres wanted to secure government funds to develop a nuclear industry. His finance minister refused to cooperate; he argued that the future was in textiles. Even the nation’s leading scientists saw Peres’ plan as “too ambitious”. With Ben Gurion’s backing, Peres funded the project “off budget”. He sent students from Technion (Israel’s Institute of Technology), to France for further training. The result was the nuclear reactor near Dimona, which has operated since the early 1960s without mishap and has reportedly made Israel a nuclear power. As of 2005, Israel was the world’s tenth largest producer of nuclear patents. From the outset, Israel has maintained an “ambiguity” policy regarding its nuclear program. Estimates within the scientific and political communities indicate that beginning in the late 1960s, Israel’s stockpile of nuclear warheads has range between 80 to 200 nuclear warheads. The official reticence, and its tacit acceptance by the United States, has long aggrieved Arab and Muslim powers. Like India and Pakistan — both also slated to attend the NSS — Israel is outside the NPT and thus avoids mandatory international inspections of its nuclear facilities. Unlike them, it has not openly tested or deployed atomic weapons. It is time for Obama to say to Israel, we will still be your friend, but we will no longer be your patsy. The picture of Bibi Netanyahu, above, is an AP photograph from Voice of America. On April 21, 2010, it will be 6 years Vanunu has waited for the right to leave Israel. It is twenty-four years he has waited for governments and media to follow up on his 1985 photos of the Dimona and 1986 testimony regarding Israel’s development of up to two hundred atomic bombs and the fact that Israel was already in process of developing neutron bombs and thermonuclear weapons. The coverup, of course, has gone on for decades. How long will our government tolerate it, especially now after the list of nations, including Israel, now owning nuclear weapons has been broadcast around the world after Obama’s visit to Russia? Have we not been taught that we shall know the truth and it is the truth, not lies, not coverups, not secret politial agreements, that shall set us free? Netanyahu’s childish decision not to attend the largest meeting of world leaders called by an American President since Franklin Roosevelt invited the world to the founding of the United Nations further isolates him and Israel. It is clearly time for Israel to come in out of the cold and acknowledge that earlier leaders secretly developed an atomic bomb and even authorized espionage against its best friend. His only success is in further isolating Israel from her neighbors and from a globe anxious about loose nuclear material. The world is increasingly tired of Israel’s–and Netanyahu’s–refusal to work comprehensively for arms control and human rights as the essential building blocks for peace. It is nothing but adolescent behavior to want everyone to play by your rules. Mr. Bailey, this is a childhood bully turned into psychotic adolescent-adult. I believe that the term “psychosis” must be used to describe Israel’s aberrent and criminal machinations against the hapless Palestinians and the ripples and circles that spread therefrom. The sooner “psychosis” is recognized as the disease via a groundswell of observers, the sooner it can be officially outed and treated — for the sake of the Palestinians, Israel, America, and the world. We listened to Mordechai Vanunu at St. George’s several years ago. He speaks as often as he can to foreign groups who will listen. I told him and the Episcopalian group there that, as we bumped along in the Negev Desert many years ago in a jeep with several others, the Israeli guides pointed to an observatory-like tower in the distance and said: “That’s Dimona, where we make nuclear weapons.” This was several years before Vanunu blew the whistle on Israel’s nuclear arsenal. How many other tourists heard that story on such a trip? Yet, the Govt. of Israel continues to play this silly but dangerous game. Wow! I haven’t got to my e-mail for a few days, just came across this. Israel is a dangerous entity, it wants to be first in the world with weapons bigger and badder than those of the U.S. I don’t know what to say, but it makes me mad that they have stolen so much technology fom the U.S., and taken our money besides.